Hauff was born in Stuttgart, the son of August Friedrich Hauff, a secretary in the ministry of foreign affairs, and Hedwig Wilhelmine Elsaesser Hauff. He was the second of four children. Young Hauff lost his father when he was seven years old, and his early education was practically self-gained in the library of his maternal grandfather at Tübingen, where his mother had moved after the death of her husband. In 1818 he was sent to the Klosterschule at Blaubeuren, and in 1820 began to study at the University of Tübingen. In four years he completed his philosophical and theological studies at the Tübinger Stift. On leaving the university, Hauff became tutor to the children of the famous Württemberg minister of war, General Baron Ernst Eugen von Hugel (1774–1849), and for them wrote his Märchen (fairy tales), which he published in his Märchen almanach auf das Jahr 1826 (Fairytale Almanac of 1826). Some of these stories are very popular in German-speaking countries to this day, such as Der kleine Muck (The Story of Little Muck), Kalif Storch (Caliph Stork) and Die Geschichte von dem Gespensterschiff (The Tale of the Ghost Ship)—all set in the Orient; as well as Der Zwerg Nase (Little Longnose), Das kalte Herz (The Cold Heart or The Marble Heart) and Das Wirtshaus im Spessart (The Spessart Inn), set in Germany. 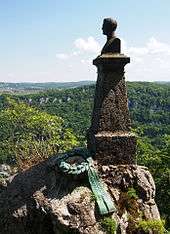 While there, he also wrote the first part of the Mitteilungen aus den Memoiren des Satan (1826; Memoirs of Beelzebub) and Der Mann im Mond (1825; The Man in the Moon). The latter, a parody of the sentimental and sensual novels of Heinrich Clauren (the pseudonym of Carl Gottlieb Samuel Heun, 1771–1854), became in the course of composition, a close imitation of that author's style and was actually published under his name. As a result, Clauren brought and won an action for damages against Hauff, whereupon Hauff followed up the attack in his witty and sarcastic Kontroverspredigt über H. Clauren und den Mann im Mond (1826) and attained his original object: the moral annihilation of the mawkish and unhealthy literature with which Clauren was flooding the country. 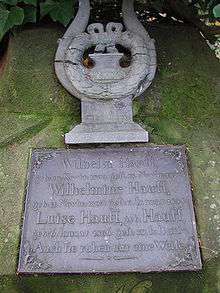 Wilhelm Hauff's grave stone in Stuttgart, Germany. Meanwhile, inspired by Sir Walter Scott's novels, Hauff wrote the historical romance Lichtenstein: Romantische Sage aus der wuerttembergischen Geschichte (1826; Lichtenstein: Romantic Saga from the History of Württemberg), which became hugely popular in Germany and especially in Swabia, treating as it did the most interesting period in the history of that country, the reign of Duke Ulrich (1487–1550). This novel was the inspiration for Duke Ulrich's heir, Duke Wilhelm of Urach, to rebuild the castle, which had fallen into disrepair, in accordance with Hauff's description. While on a journey to France, the Netherlands, and northern Germany he wrote the second part of the Memoiren des Satan and some short novels, among them the charming Die Bettlerin vom Pont des Arts (1826; The True Lover's Fortune; or, the Beggar of the Pont des Arts) and his masterpiece, the novella Phantasien im Bremer Ratskeller (1827; The Wine-Ghosts of Bremen). He also published some short poems, which have passed into Volkslieder, among them "Morgenrot, Morgenrot, leuchtest mir zum frühen Tod?" ("Dawn's light, you are lighting my way to early death") and "Steh ich in finstrer Mitternacht" ("I stand in the darkest midnight"). The novella Jud Süß was published in 1827. 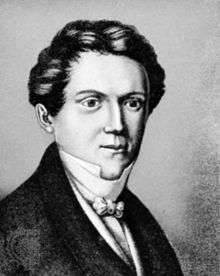 In January 1827, Hauff undertook the editorship of the Stuttgart Morgenblatt and in the following month married his cousin Luise Hauff, but his happiness was prematurely cut short by his death from (typhoid) fever on 18 November 1827. His Sämtliche Werke (Collected works), with a biography, edited by Gustav Schwab were published in 3 volumes 1830–1834, and 5 volumes (18th ed.) in 1882. They were also published by Felix Bobertag 1891–1897. A selection from his works was published by M. Mendheim (3 vols, 1891). Considering his brief life, Hauff was an extraordinarily prolific writer. The freshness and originality of his talent, his inventiveness, and his genial humour have won him a high place among the southern German prose writers of the early nineteenth century. Little Longnose, a 2003 Russian animated feature based on one of his stories. Geschichte vom kleinen Muck, a 1953 film.